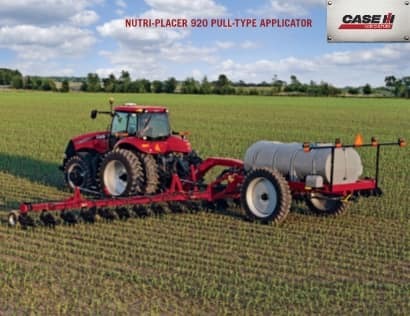 Nutri-Placer® pull-type fertilizer applicators are designed to improve the productivity of every pass. With durability, flexibility and reliability that has been proven on millions of acres and a variety of field conditions, the Nutri-Placer family will fit nearly any soil type. Built to the standard of both professional producers and commercial applications, you can count on the Nutri-Placer for precise nutrient management. Capable of speeds up to 11 mph, Nutri-Placer 930 and Nutri-Placer 940 models are now available with a High-speed Low Disturbance (HSLD) Row Unit. This new option allows you to cover more than 900 acres in a 12-hour day. And this increased productivity is matched with superior agronomic performance. In extensive field testing, the HSLD Row Unit provided better residue cover and a more level surface finish than other coulter-style applicators available. Spring or fall, producers and professional applicators can count on the Nutri-Placer HSLD coulter to make the most of every acre, every application. The Nutri-Placer 930 HSLD places nutrients up to 6 inches deep in the root zone — when and where crops need it most. New 22.6-inch single coulter cuts through residue with minimal soil disturbance for improved nutrient retention. Industry’s highest speed capability provides increased acres per hour, lower tractor hours and reduced fuel consumption. 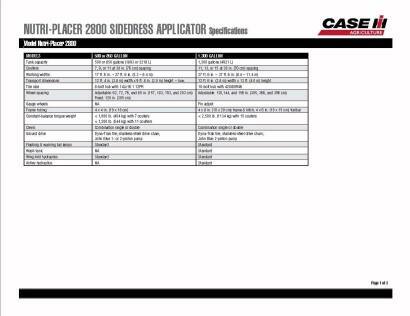 Cast-iron components and reduced maintenance keep you in the field during fall, preplant and side-dress applications. Cuts through heavy residue without plugging — even at high speeds and in tough, fast-changing conditions. In Case IH field testing, the Nutri-Placer 930 HSLD provided better residue cover, significantly fewer clods and reduced lateral soil movement compared with competitive coulter-style applicators. Uniform surface finish preserves valuable ground cover in highly erodible land and heavy, no-till corn conditions. Improves soil and moisture retention to reduce run-off and maximize crop uptake. 22.6-inch single coulter cuts through residue with minimal soil disturbance up to 11 mph. A 4-degree blade angle opens a precise slot for accurate nutrient placement. Spring loaded, cast-iron knife features carbide inserts for extended wear and protection of fertilizer tubes. A rear Beaver Tail attachment with tungsten carbide weld ensures optimal fertilizer placement. Wiper wheel holds soil in place while the coulter opens a slot. It also eliminates soil and residue buildup between the wiper and coulter blade. Closing system features a SharkTooth® blade and walking tandem press wheel to firm the soil. No-tools required spring down pressure and pivot range adjustments make changes quick and easy. The ground-engaging components on the Nutri-Placer fertilizer applicator help you more precisely place nutrients. Choose from three row unit options, including the new High-Speed Low Disturbance (HSLD) coulter. From the rugged frame to easy folding for transport, the Nutri-Placer was built to cover a lot of acres in a day. It delivers durability you can count on season after season. The front hitch allows you to hook up to your tractor and get going, and your rear hitch allows tow-behind implements and tanks. 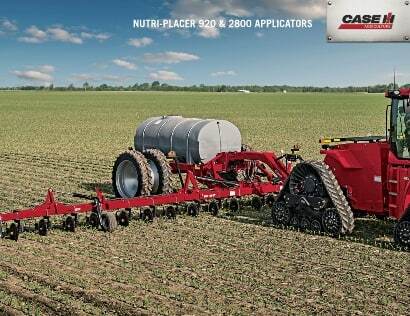 Case IH Advanced Farming Systems (AFS) helps you precisely manage nutrients. From autoguidance that helps keep each pass straight to variable-rate application that helps you more efficiently apply nutrients to a fully integrated platform that gathers data during every phase of production, AFS is the ideal fertilizer companion. 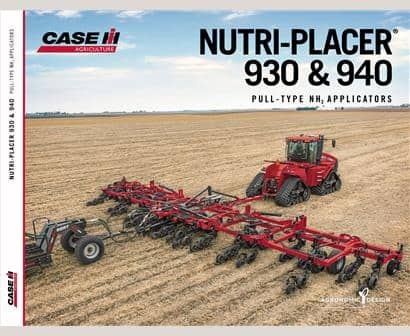 Featuring a working width ranging from 60 to 65 ft (18.3 to 19.8 m) the Nutri-Placer 940 is available 15 or 30 in (381 or 762 mm) row spacing to meet your needs. 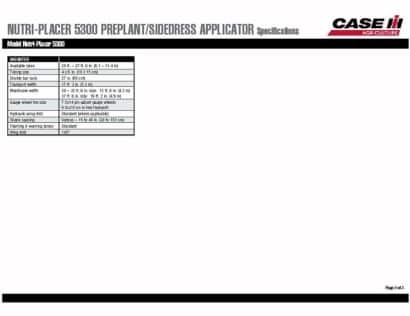 The Nutri-Placer 5300 mounted or pull-type applicator versions can be used for both preplant and sidedress application, to band nutrients in the soil root zone for optimum fertilizer utilization. 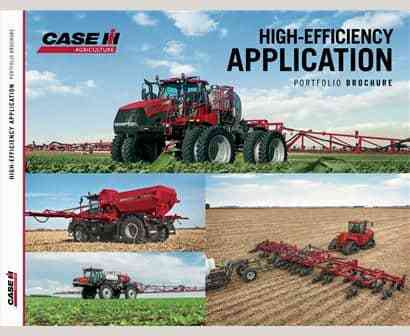 Increase nutrient update, minimize runoff and see high returns with yield-boosting power from fertilizer applicators and other Case IH crop production equipment. Timely Fertilization? How Does Over 900 Acres a Day Sound? Enhance your seedbed conditions while you manage crop residue, improve soil tilth and band plant food in the root zone with Case IH custom-fit strip-till systems. ​Configure and price your new fertilzer applicator. Customize it the way you want.